NEW YORK — Still annoyed by CNBC’s handling of this week’s presidential debate, the Republican National Committee said Friday that it was suspending its partnership with NBC News and its properties on a primary debate scheduled for February. NBC News said it was disappointed in the development and will work to resolve the issue with the GOP. It was unclear in the letter from RNC Chairman Reince Priebus to NBC News chief Andrew Lack whether the party would forbid NBC from televising the Feb. 26 debate and open up the broadcast rights to others. The debate was expected to be telecast on NBC and its Spanish-language partner, Telemundo. Prebius’ letter also comes amid the backdrop of the individual campaign organizations planning a meeting Sunday to air out grievances about the debate process and suggest changes — a meeting that is pointedly excluding the Republican National Committee. Prebius said candidates were also promised an opening question on economic matters; instead candidates were asked to outline their greatest weakness. He also said not enough was done to ensure candidates received relatively equal time on the air; Bush campaign officials reportedly complained to CNBC while the debate was going on that their candidate was not getting enough time. 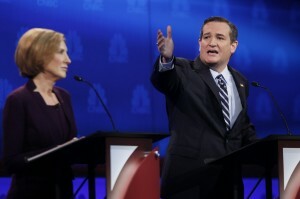 CNBC and some of the candidates also argued prior to the debate about its length. The Trump campaign said on Friday it supported the committee’s decision. “We look forward to pursuing alternatives along with the RNC to ensure candidates are given ample opportunity to outline their vision for the future of our country,” said campaign spokeswoman Hope Hicks. During a rally Thursday in Nevada, Trump suggested that Republican debate moderators be required to prove that they vote Republican. “Why should we have these people that hate everything we stand for?” he asked. While cutting NBC out of the process, the RNC said it still intended to have a debate that day with its other partner, the conservative National Review. It also remains to be seen that, barring any accommodation with the RNC, NBC might try to skirt the party and hold some sort of debate on its own. Debates have unexpectedly become big business for the television networks. The three GOP debates — on Fox News Channel, CNN and CNBC — all set viewership records for those networks. The CNBC debate on Wednesday was seen by 14 million people, more than Game 2 of the World Series between the New York Mets and Kansas City Royals.